Do I need to fill in migration details again if purchase of Data Migration Service Package was interrupted? 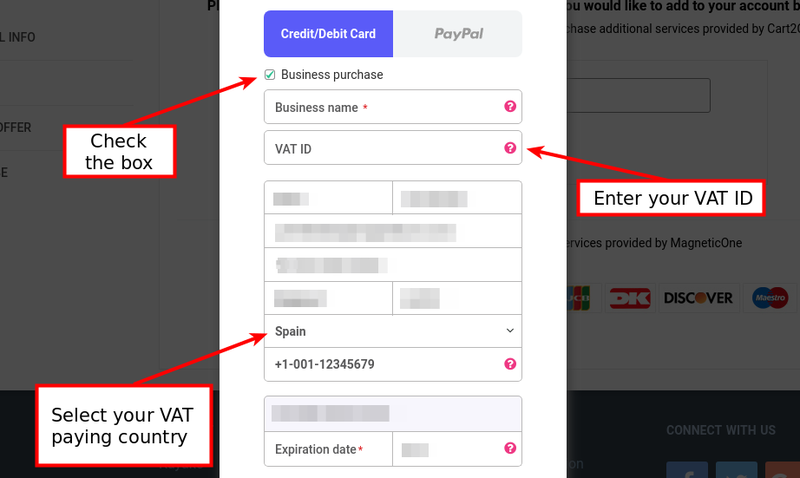 If you filled in information needed for purchasing Data Migration Service Package and clicked “Purchase” button but didn’t finish checkout, you can proceed with the payment later without the need to provide migration details again. To do this, log in your Cart2Cart account and click Profile. Then, click Billing and “DD PACKAGE FUNDS” button. 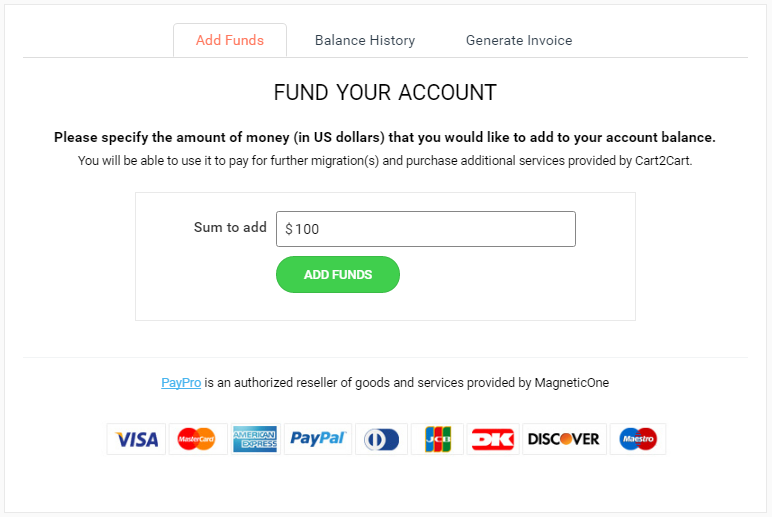 Afterward, you’ll able to check the migration details or proceed with the payment right away. You can calculate the exact price of your migration previously using Migration Estimator. How does tax collection work? Cart2Cart uses Paypro global payment processor that includes the VAT rates for European citizens in accordance to international law. In order to check out the VAT rates depending on countries click right here. For Canadian residents, the GST/HST is collected and paid to the Government of Canada. However, according to a Canadian law, you can get a compensation from the State by providing GST number of the company receiving the payment, i.e. Cart2Cart. Please, contact our support team to request the GST number. The residents of other countries won't be charged with VAT for refilling Cart2Cart account. How to get an invoice for my migration? 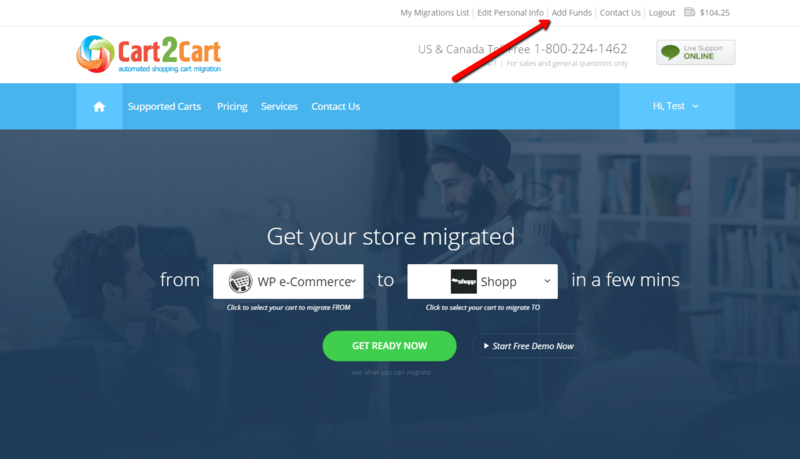 Alternatively, you can generate an invoice directly on Cart2Cart website. To do this, log in your Cart2Cart account, go to My Payments tab and click Generate Invoice. How to fix PayPal authorization error: Do Not Honor? This type of error typically occurs because your bank aborts transaction. That means that your information passes validation at Cart2Cart’s end, but your bank declines the authorization of your payment. Contact your bank as soon as it is the only transaction party that can see your authorization attempts. Let your bank manager know that you wish your transaction to go through. After, you’ll get a confirmation from your bank that you can try to pay again. Replace Cart2Cart order and pay as usual. Does the cost of remigration include the price of additional options? Remigration Service costs 50% of your initial Full Migration price. However, additional options are charged additionally according to their pricing. In other words, if your full migration costs $80, then Remigration Service will cost you $40. But if you also select additional option Migrate categories and products SEO URLs for $59, the final price will be $99. I run into an error during the payment process. What shall I do? There are several things that may go wrong during the payment process so there may be several solutions. First of all, try to clear your browsing history, cache and cookies. In some cases it will be enough to use a hot key combination Ctrl + Shift + Delete. If it doesn't work try to follow specific instructions for your browser. Also, make sure your credit card number is entered with no spaces or dashes and your name is typed exactly as it appears on the credit card. The CVV code on Visa/MC will be a 3 digit number on the BACK of the card. The American Express CVV is the 4 digit number on the FRONT of the card. Avoid hitting the back button when making the purchase. In case if none of above didn’t help feel free to contact our Support Team. Can I pay for a service with Credit Card? Yes, you can pay with all major credit cards, like Visa, MasterCard, Maestro and American Express. 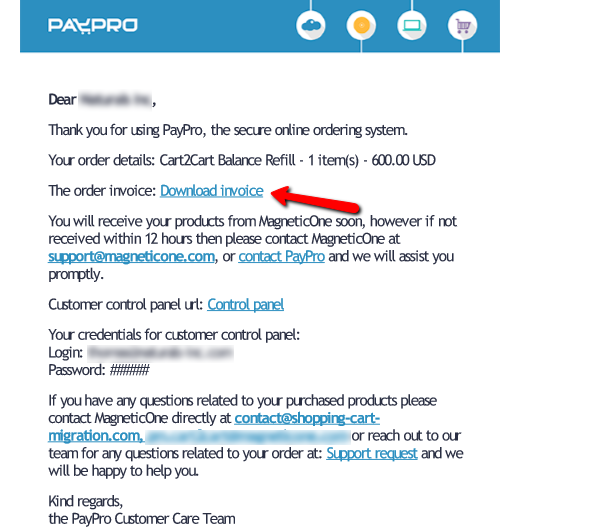 Can I pay for migration with PayPal? 1. Login to your Cart2Cart account. 2. Click Add Funds on the top of the page. 3. Enter the amount of credits and hit the green button. 4. 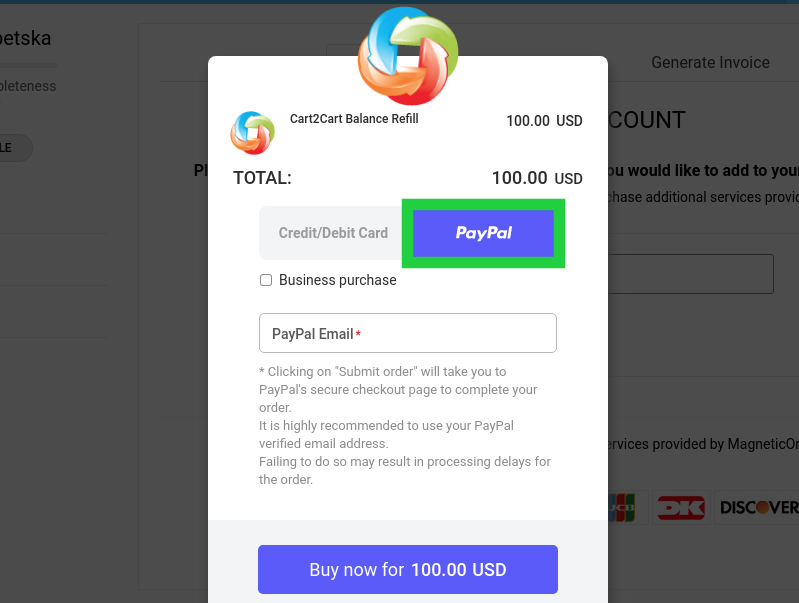 After this, you will be redirected to the checkout page where you'll be able to select PayPal as your payment method and submit an order. You are trying to pay from the other location than your credit card was registered to. An email address you’ve entered is not associated with PayPal account. You’ve meet transaction limit that was settled by your bank. In case of troubles during checkout process, please, contact our Support Team for further instructions. To perform payments you need to fill your Cart2Cart account balance. To do that, login to your account and open the Add Funds menu. 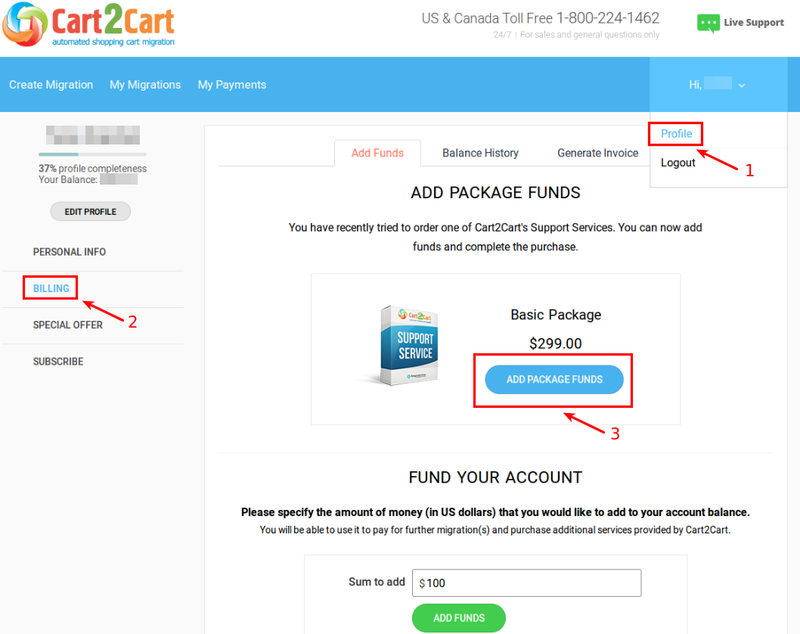 To perform payments you need to fill your Cart2Cart account balance. Enter the amount of money you’d like to add and click on Add Funds button. Can I try your service before setting up paid migration? Yes, we provide FREE Demo Migration service that you can use before starting full migration. You should create an account and setup the source and target carts. You will be able to check the results of a limited number of entities (up to 10 products/customers/orders). Approximate time of Demo Migration is 10-30 minutes. You can make any changes you need and run DEMO migration again. After you are satisfied with results you can run the live migration. Unfortunately,we don't provide refunds for finished migrations. Thus, we strongly recommend to use the free DEMO migration to check the results before setting a paid migration. How to avoid paying VAT? You do not need to pay VAT if you are a business with a valid VAT ID. Please note: to receive a refund, you need to provide the details of a legal person.